After running an apartment study focusing on the nation’s top 20 boom towns of 2016, it was revealed that the U.S. apartment market is booming with over 1,400 large-scale projects under construction in the country’s biggest metros. More than 50 apartment buildings providing 320,000 new apartments are expected to hit the market this year - 50 per cent more activity than in 2015 - and no one is worried about it. In fact, it's being celebrated. 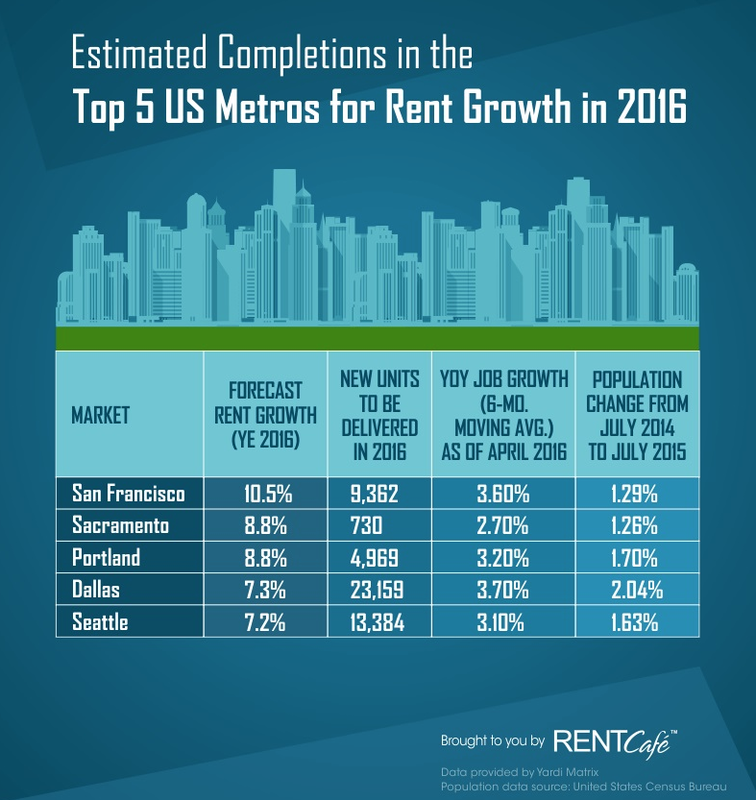 According to RENTCafe, the rental market is firing on all cylinders in the largest construction boom America’s seen over the last decade. One-bedroom apartments make up the biggest chunk (51%) of the rental stock projected to come online this year, followed by 2-beds (37.5%). Texas leads apartment construction with approximately 70,000 units projected to be delivered in 2016. The New York metro area is set to construct an estimated 21,000 apartments this year, and San Francisco’s housing shortage may ease up with nearly 9,500 new units expected to hit the market. Despite the weakening energy market, strong job gains in the leisure, hospitality, education, and healthcare sectors are keeping Houston’s job market vigorous, which in turn favours household formation. 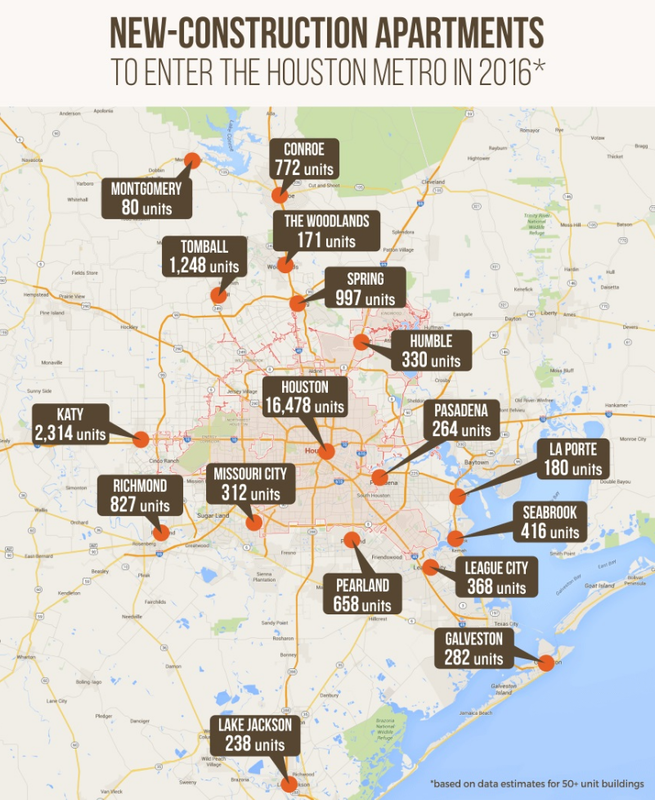 Approximately 26,000 new apartments in 95 rental developments are projected to come online in the Greater Houston metro area this year to meet the growing demand for rental housing. The largest apartment community to be completed in 2016 in Houston is Tate at Tanglewood with 431 units to be added to the Galleria/Uptown submarket. 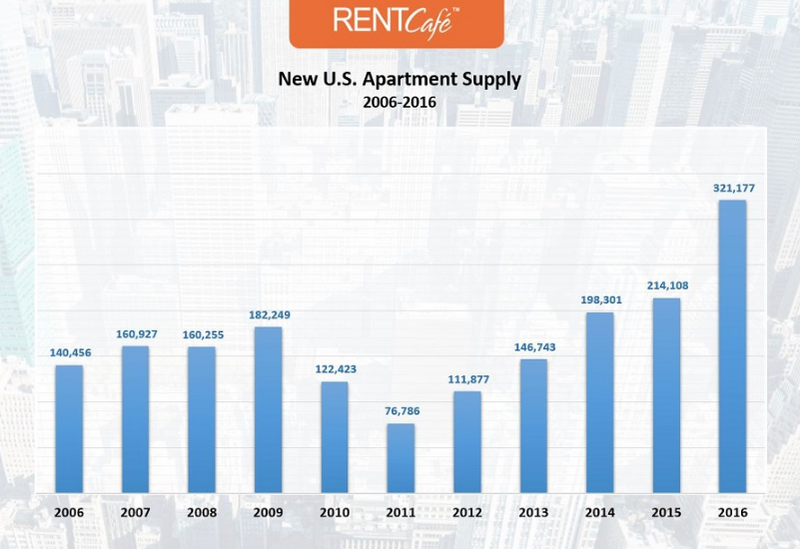 RENTCafe’s report suggests that the growth of interest in apartments is due to low inventory levels and increased demand over the last year. Apartment hunters are also being told to enjoy the multitude of new rental units coming online, as it may “turn the tables in the renters’ favour”. American rental prices are considered to be at an all-time high, but may be starting to lose steam, judging by peaked rent growth at 6.3% at the end of 2014 which slowed to 5.6% in 2015. “Where there’s choice, there’s competition and, in this case, competition translates into concessions, lower rents, and a more relaxed housing landscape in general,” the report said. One-bedrooms make up the biggest chunk (51%) of the rental stock projected to come online this year. Studios rank lowest on developers’ preferences when it comes to bedroom distribution, holding approx. 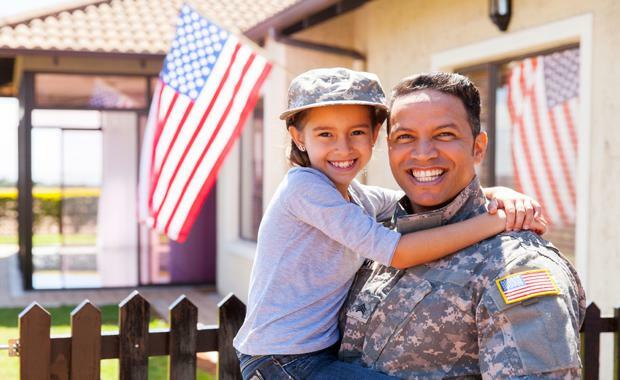 4.7% of the new rental inventory. 2-beds take 37.5% whereas 3+ beds represent 6.8% of 2016’s new supply. According to the report, the low inventory levels and increased demand have been the main culprits for the staggering rental growth over the last year. But the plethora of new rental units coming online may finally turn the tables in the renters’ favour: where there’s choice, there’s competition and, in this case, competition translates into concessions, lower rents, and a more relaxed housing landscape in general. While average rent prices are indeed at an all time high, the overheated rental market is starting to lose steam. Rent growth peaked at 6.3% at the end of 2014 but slowed to 5.6% in 2015, with a projected 4.4% increase by the end of 2016. 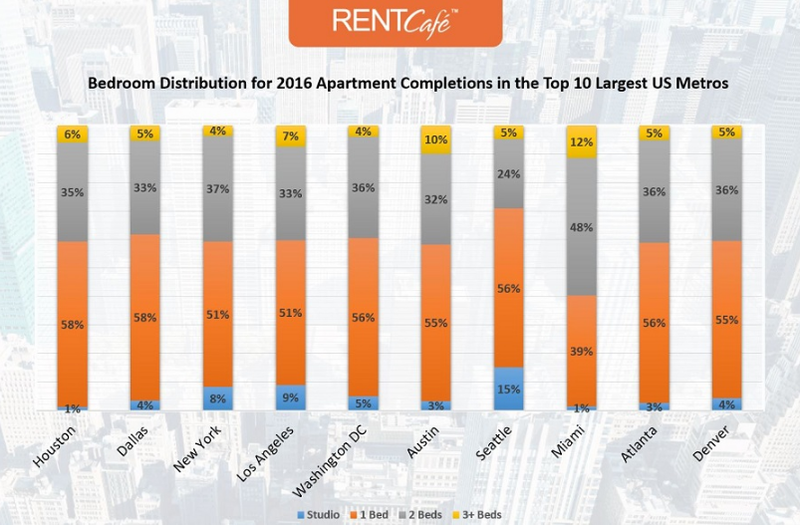 Content and data from RentCafe.